Madden NFL Social launched two weeks ago on Facebook with almost no announcement from EA Sports. They were waiting for today, when the game's mobile application hit iTunes. 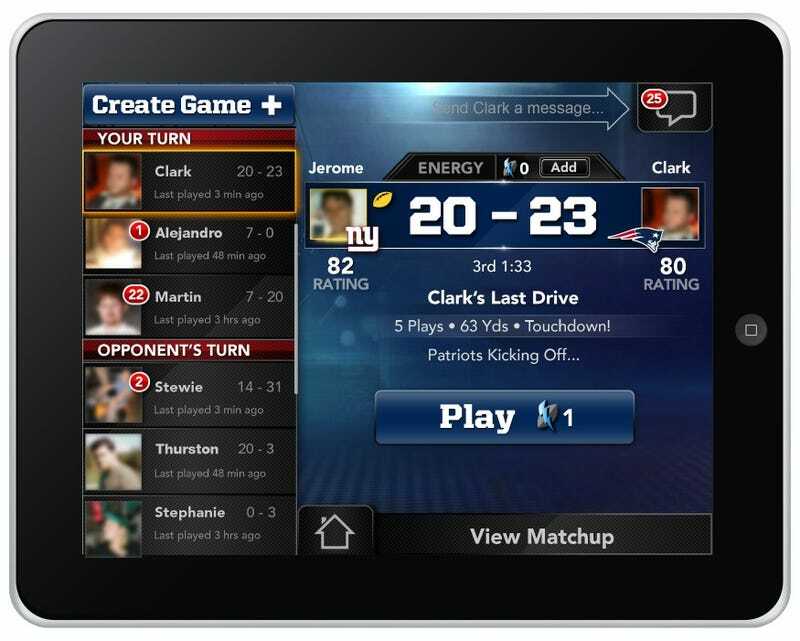 Social combines aspects of the player management and collection seen in modes like Ultimate Team and the Facebook game Madden NFL Superstars, with a bite-sized gameplay experience that wisely avoids the trap of trying to deliver every component of a console sports simulation to a mobile port. You'll play against friends (and there's always a bot for you to scrimmage) but the showdowns don't take place in real time, never last more than one drive (successful or otherwise) and you never have to play defense. You'll be matched against a bot defense with your friend's personnel ratings (and vice versa). When you end a drive, successfully or otherwise, he'll get notified that it's his turn to play. The gameplay itself isn't particularly thrilling, and an iPhone 4 really slows down when the ball is snapped, particularly as the camera zooms in on your runner. But on the whole it offers a decent American football fix that doesn't take forever and doesn't lard up the screen with virtual buttons and hot route gizmos. You have a spin, you have a juke, you can toss it to a receiver by tapping his icon. That's really all you need. However, this is a free-to-play social game, so it brings with it some familiar aspects of that scene. When you begin Social, you have about 10 "drives" you may play, and they replenish at a rate of one per hour. Yes, you may buy more "drives," using the game's virtual currency or, surprise, real money to buy virtual currency. Players are acquired in card packs a la Ultimate Team, and naturally the good ones cost more in virtual currency. If this isn't your cup of tea, guess what, there's Madden NFL 13 on the PlayStation 3 and Xbox 360, and it's pretty damn good this year. EA Sports seems to have figured out the futility in trying to port all of that into a mobile platform, an effort that always made me wonder why I was not just playing the full console version instead. The integration with Facebook has built a game there that is a lot more interesting than Superstars, a barebones social game whose appeal wore off for most folks after a couple of weeks. Separately, these two would not be much of a compelling experience, but together, they do a good job of creating a game that draws out the strengths of its two platforms. The gameplay on the mobile device keeps the gameday experience from becoming stale (I was delighted to see real stadiums in the game, too.) I guess this is a better Facebook game than it is a mobile game, even if the best quality of this Facebook game can only be accessed from a mobile device. Consider it a Facebook game with a mobile extension. The problem with sports development on mobile devices was that, after they realized they could bring something very close to a full console experience to a smartphone or a tablet, no one really answered the question of if they should. Looking around at how poorly reviewed these sim-style mobile ports have been-even NBA 2K13-it's pretty clear the answer is no. EA Sports is taking Madden in a different direction, focusing on what is enjoyable about football on this platform, and just tossing out anything that isn't. I think that's the right call.